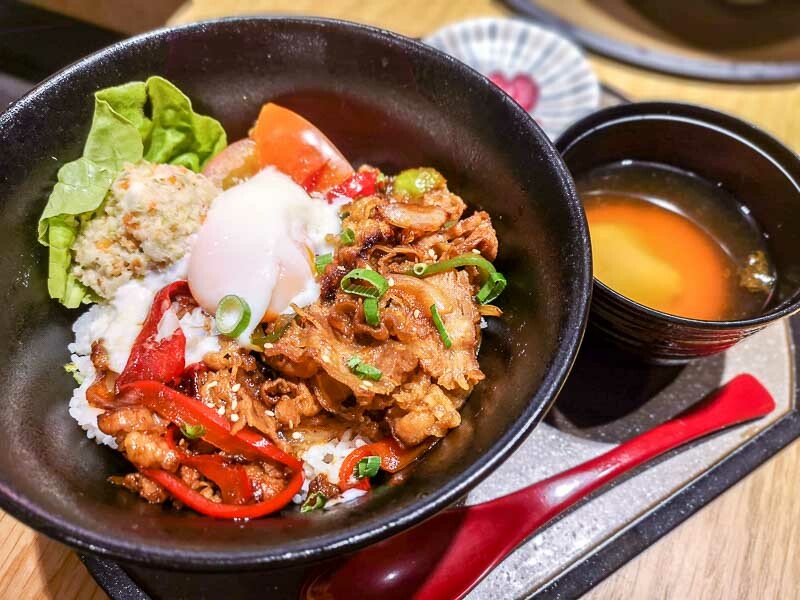 It’s hard to think of Singapore weather as ever chilly, but hey, when the monsoon season hits or when you’re down with the flu, nothing lifts your mood like a wholesome bowl of noodles or soup. 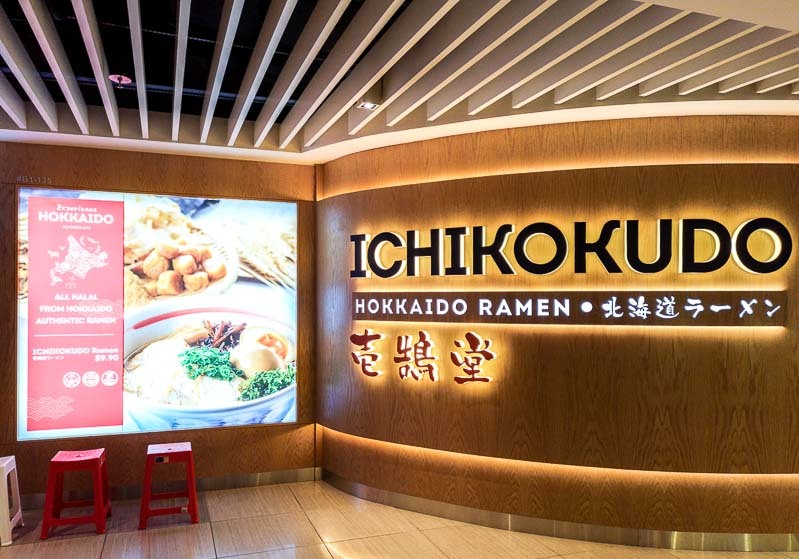 You now have one more option at your disposal, with Ichikokudo Hokkaido Ramen, nestled in the basement of Suntec City. 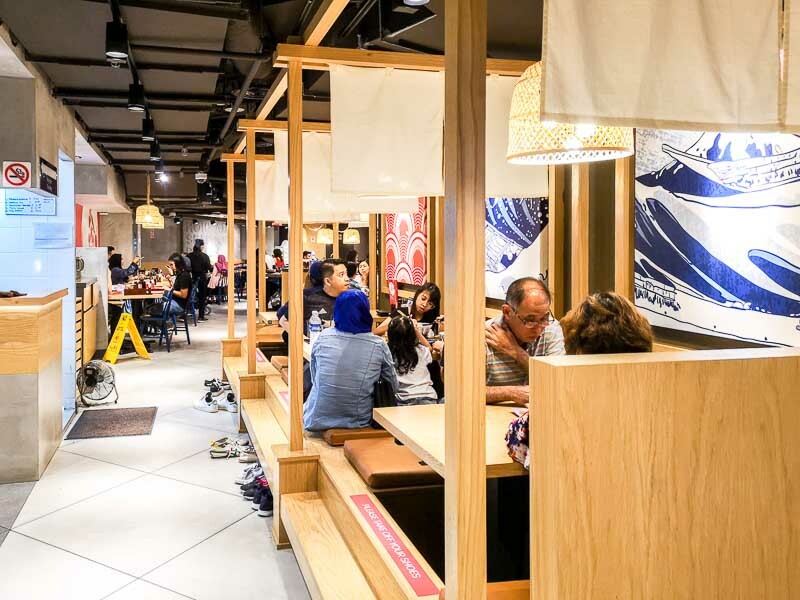 The best part is that it’s halal-certified, allowing our Muslim friends to enjoy a tantalising array of rich ramen recipes, which is something that isn’t easy to come by. The interior is very bright, with its walls splashed with colour and the furniture made of light wood, resulting in a dining space that’s comfortable and inviting. 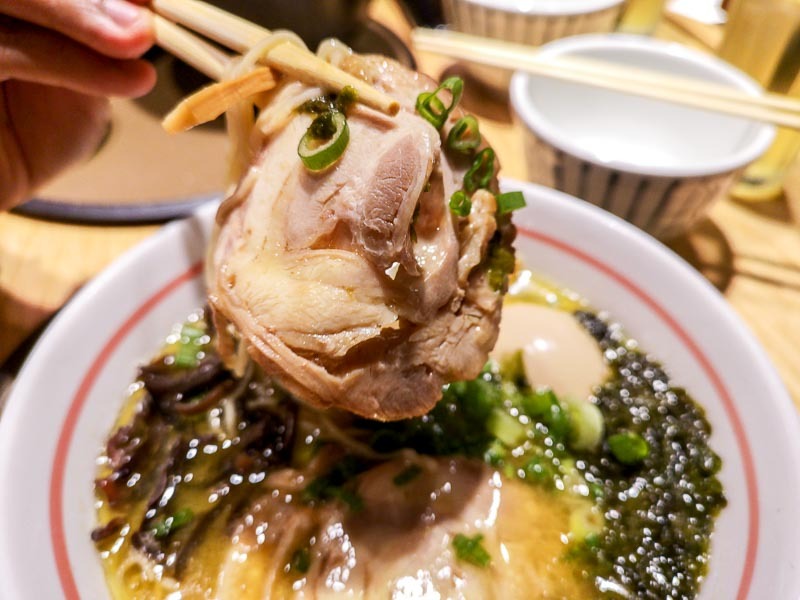 With no use of pork to flavour their broth, they instead use chicken bones that are simmered for several hours, finished with a blend of bonito and mackerel as well as Hokkaido kelp. 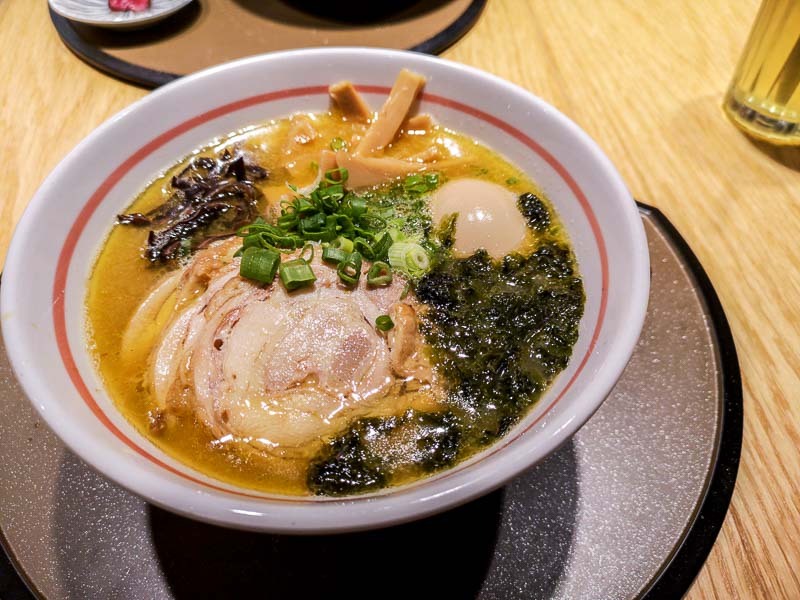 The classic Ichikokudo Ramen (S$9.90) has a soy sauce base, with chicken and seafood. I thought the broth would be lighter given the swap in the protein used in its broth, but it was actually amazingly savoury and rich! If you’d given me a blind taste test, I would have never guessed that chicken was used. Aside from how intense the flavours were, I loved how subtly sweet it was as well. The ramen noodles were springy and full in the mouth, while the chicken chashu tore apart easily upon being picked up. 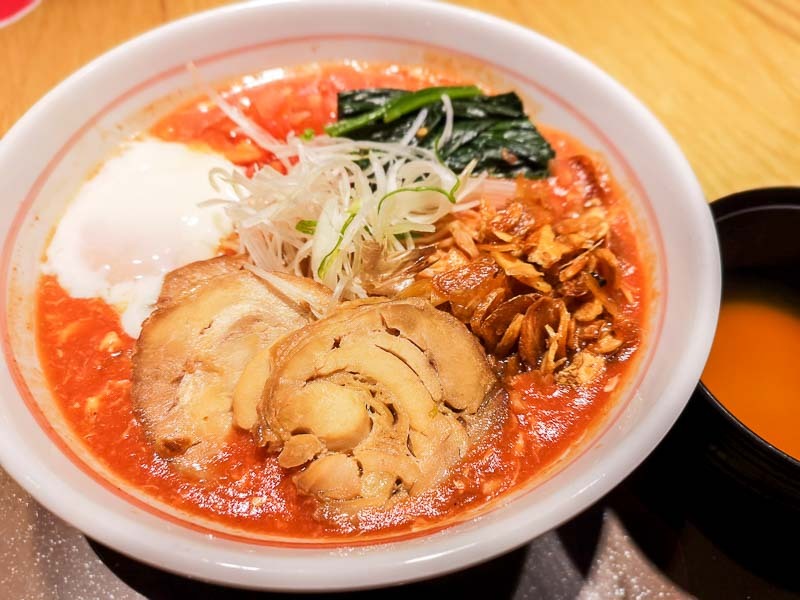 A range of ramen that caught my eye on its menu was the Daichi Tomato range, which pairs chicken broth with tomato puree and tomato juice. 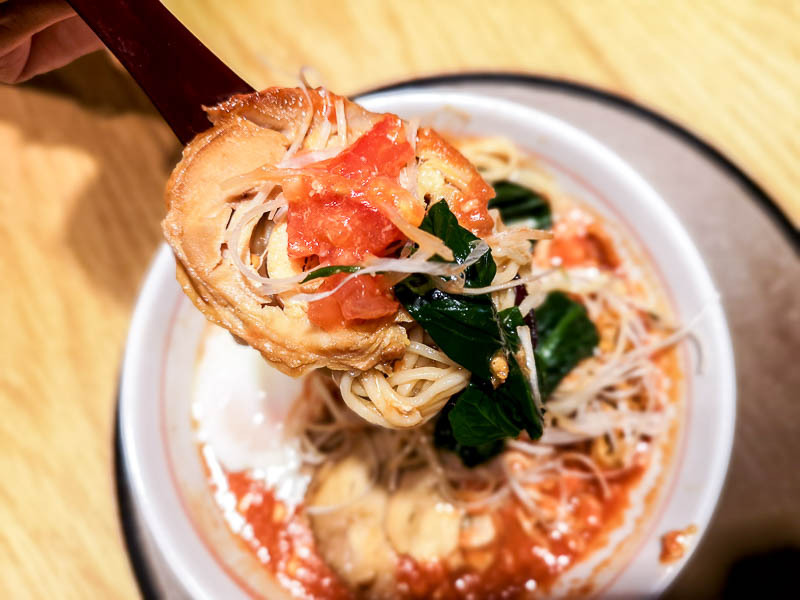 The Daichi Tomato Double Egg Ramen (S$12.90) features egg ribbons in the soup, topped with a soft-boiled egg, chicken chashu, spinach, fried garlic chops and white leek. Now, I have to announce a disclaimer that I really dislike tomatoes, especially when consumed raw. The only way I’d eat tomatoes is if they were masked with other ingredients and cooked all the way through (till the point of little recognition). I wanted to like, if not love, this bowl, but the sharp familiar acidity and strong taste of raw tomatoes overwhelmed me and I couldn’t go beyond a single scoop. I couldn’t detect the chicken broth at all, and unfortunately, I had to surrender this to my dining partner who surely was amused by my moment of displeasure. There’s also the Hokkai Jigoku range that infuses spicy miso into their chicken broth. I don’t notice a lot of duck ramen around, so I was looking forward to trying the one here. 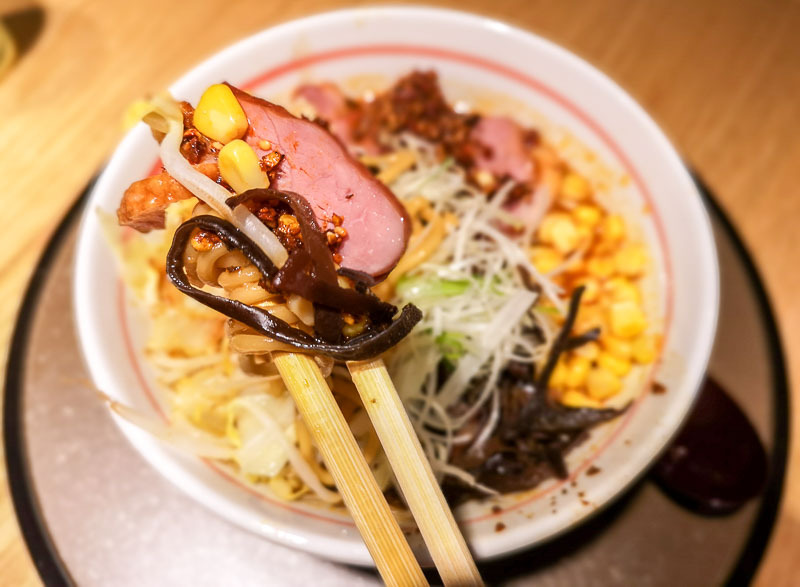 The Hokkai Jigoku Smoked Duck Ramen (S$15.90) has not only an attractive price point but also a deep, earthy flavour that’s quite different from their signature ramen. All the ramen here use the same stock, but so far, every bowl has surprised me in terms of varying flavour profiles. Although I still preferred the original, I really appreciated this bowl for its contrasting textures from the wood ear mushrooms, the crunchy corn and the tender smoked duck. 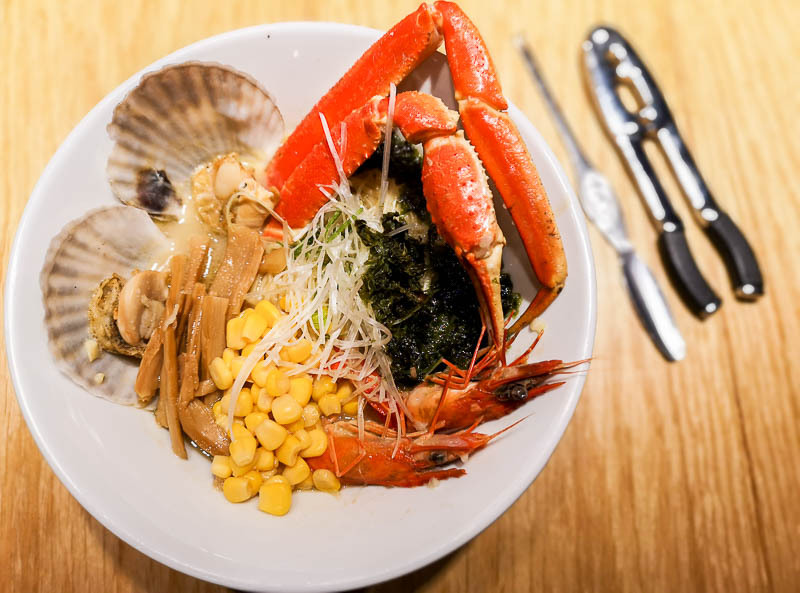 Fans of seafood will absolutely the Hokkai Jigoku Ramen Gifts From The Sea (S$18.90). It’s brimming with corn, wood ear mushrooms, crab leg, shrimp, scallops, boiled vegetables, white leek and chilli powder. For less than S$20, I would say this is truly a steal. The seafood was fresh, sweet and succulent. 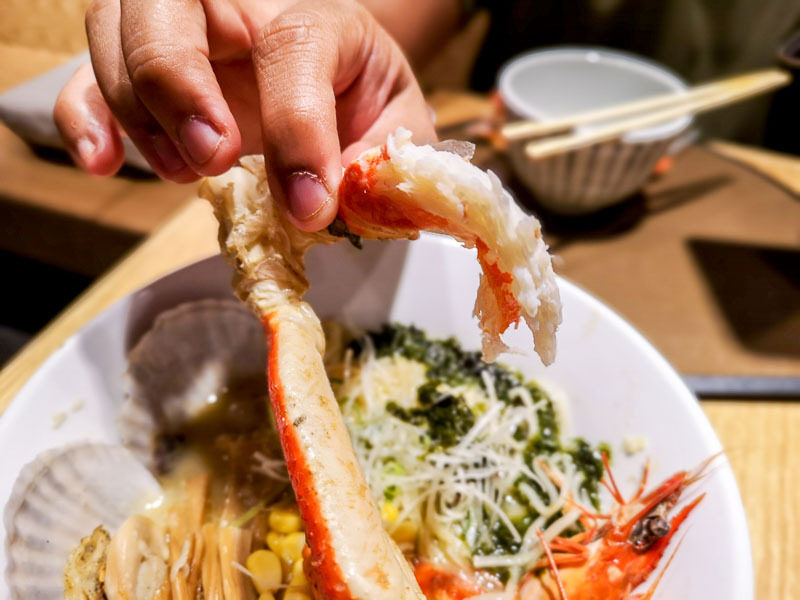 However, I felt that the broth didn’t do justice to the high-quality seafood, and there was a disconnect between broth and ingredients. 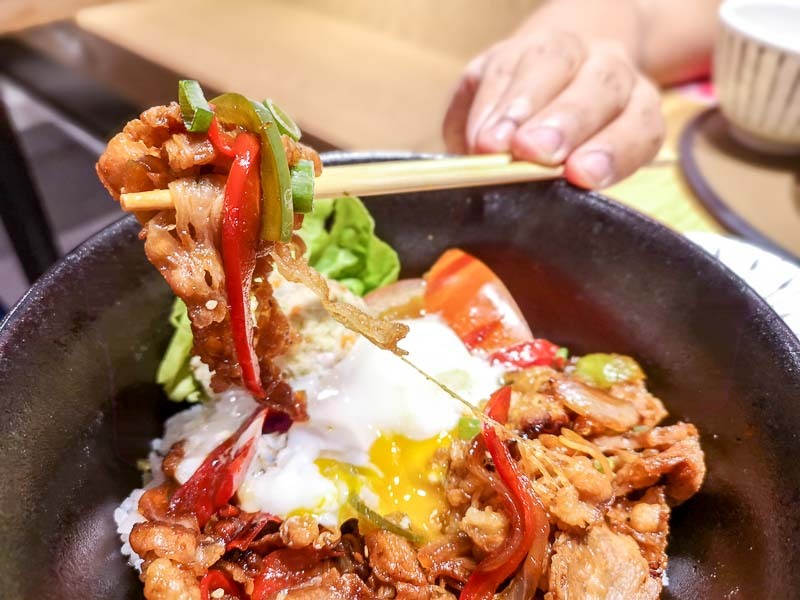 There are also donburis available, and my immediate choice was the Japanese Style Beef Yakiniku Don (S$12.90) from the Donburi Grill section, which features grilled meat and seafood on a bed of rice drizzled with sweet sauce. It only went as far as its looks sadly, as the thinly-sliced beef was the only good thing about the donburi. I enjoyed how the runny egg yolk luxuriously coated the sliced beef. The rice was slightly too clumpy and dry for my liking, so much so that I had to wet the rice with more soya sauce on my own. Such a shame. 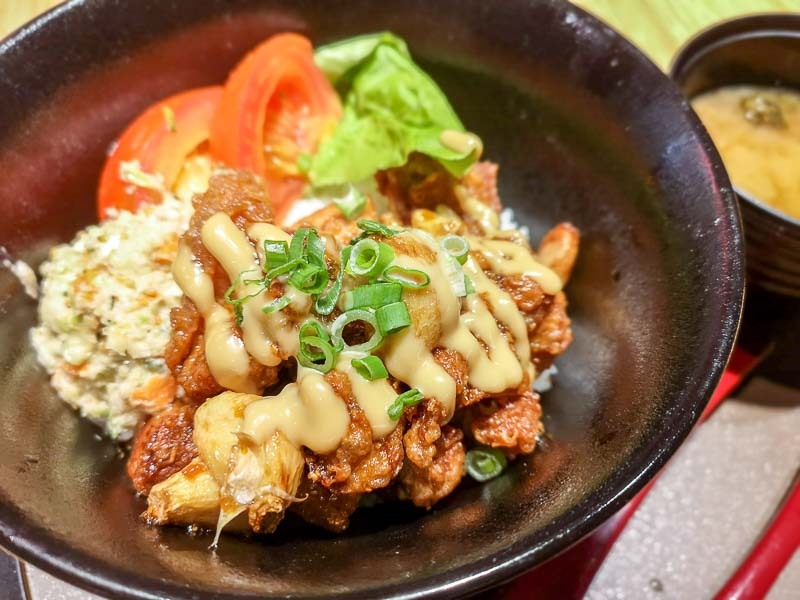 There’s also the Japanese Garlic Karaage Don (S$10.90) that’s meant to have an aromatic garlicky bite (that’s my assumption, at least). Again, it let me down with little to no trace of garlic as I took a generous bite out of the karaage. 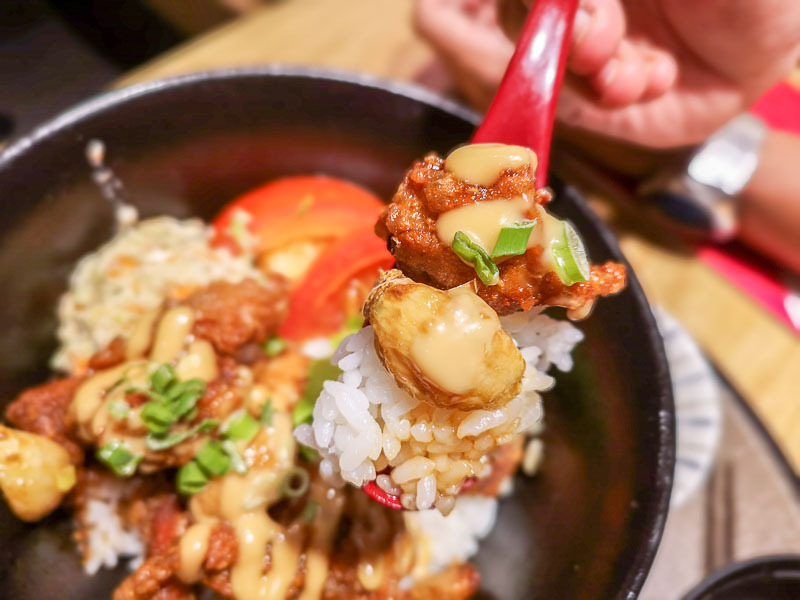 I was met here as well with rice that wasn’t sticky enough for me to want to waste my carb allowance, and the grease on the karaage was a tad overwhelming. I say, stick to the ramen — they won’t let you down. 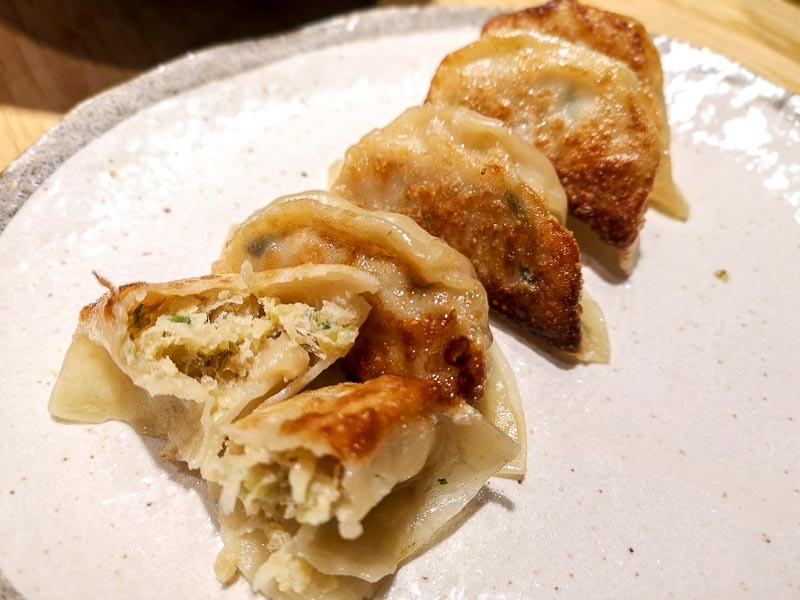 I understand how tempting it is to order a side of gyoza when enjoying a serving of ramen, but I would say you can skip out on a portion of Ichikokudo’s Grilled Gyoza (S$6.90). It was bland and the gyoza skin was too chewy for my liking. Safe to say, my search for outstanding gyoza has yet to be fulfilled. 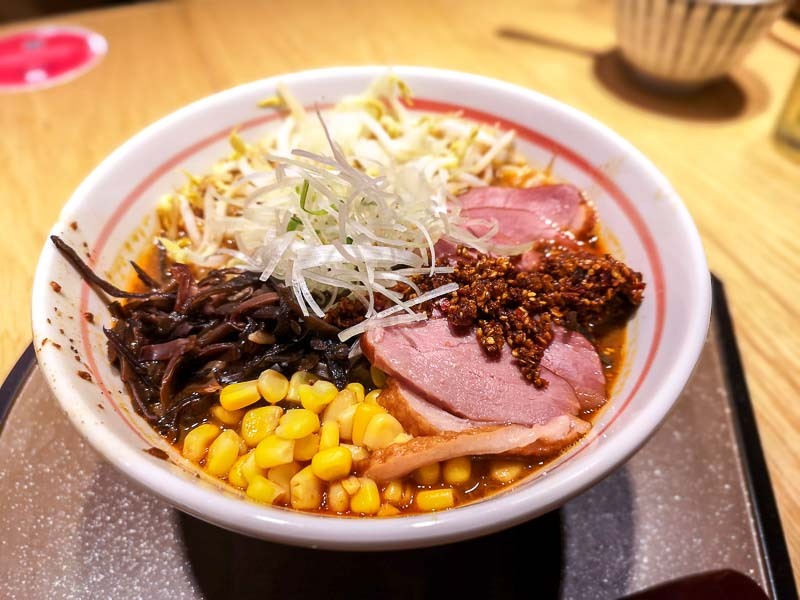 For a ramen place that prepares all its food sans pork, all its flavours were nothing short of decadent and delectable. However, their donburis were nothing fantastic to speak of, so I highly recommend you stick to ordering the former. 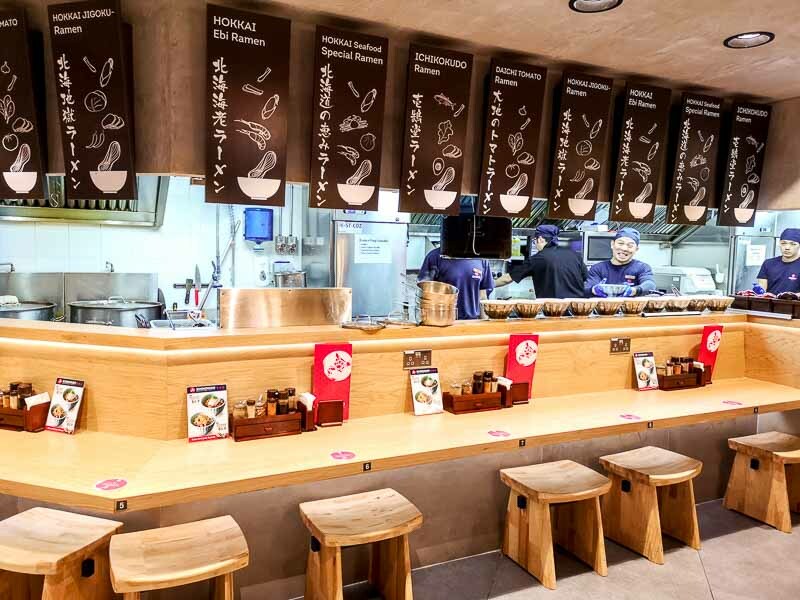 My top pick has to be the Ichikokudo Ramen, which was original, mouth-watering and exceptionally satisfying. It’ll probably the main reason for my return. Update: I returned with high hopes on a busy weekday evening. The Ichikokudo Ramen this time around was exceptionally greasy and the only reason I finished it was because I was hangry. The additional surprise was how sickly my stomach got when my dining partner and I reached home; we both had a case of pretty bad runs and I suspected it was because of the excessive oil. Let’s just hope it was a one-off incident of bad luck and not a result of increasingly deteriorating standards.